Thomas N. Wight completed undergraduate work at the University of Maine and graduate work at the University of New Hampshire, receiving his Ph.D. in 1972. After a postdoctoral fellowship in the Department of Pathology at the University of Washington in Seattle, he returned to the University of New Hampshire as a faculty member from 1974 to 1978. He rejoined the Department of Pathology at the University of Washington in 1978 and has remained at this institution, where he holds the rank of Professor of Pathology. Dr. Wight's long-standing interest in the role of proteoglycans and hyaluronan in vascular biology has established him as one of the world's leading experts in this field of research. He has been named an Established Investigator of the American Heart Association and has served on several study sections of the National Institutes of Health. Dr. Wight is a member of the American Heart Association and the American Diabetes Association and serves on the editorial boards of the journals Arteriosclerosis, Thrombosis and Vascular Biology; the Journal of Histochemistry & Cytochemistry; the Glycoconjugate Journal , and the Archives of Biochemistry and Biophysics. He has published over 120 articles on proteoglycans and hyaluronan. Blood vessels carry blood to and from the heart through a branching system of arteries and veins. The large and medium-sized arteries consist of three distinct layers: intima, media, and adventitia (Figure 1). 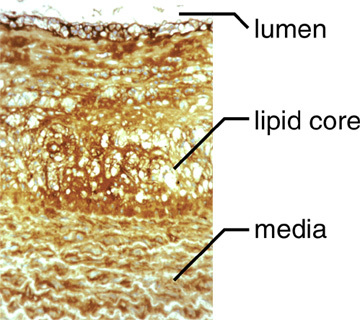 These layers are formed by cells embedded in a mixture of hyaluronan and other molecules that entangle and cross-link to form the extracellular matrix (ECM). All three layers differ from one another in their cellular and ECM composition. The intima, the innermost layer, is composed of endothelial cells attached to an underlying mixture of ECM molecules termed basement membrane. 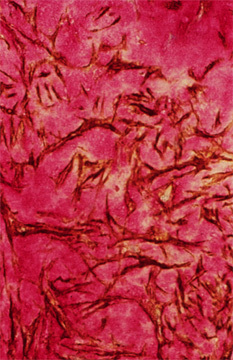 Beneath the basement membrane is a thin layer of ECM containing an occasional smooth muscle cell. The media is separated from the intima by the internal elastic lamina, a band of elastic tissue. This layer is composed of concentrically arranged smooth muscle cells separated by bands of elastin and small amounts of ECM. The adventitia, the outermost layer, consists of a sheath of connective tissue cells (fibroblasts) embedded in a dense ECM. Fig. 1　Structural changes that occur during atherosclerosis and restenosis. A. Normal artery. B. Atherosclerotic artery containing lipid core (yellow) and markedly thickened intima (purple). C. Atherosclerotic lesion that has been removed by balloon angioplasty to reopen the artery. D. Restenotic lesion that has re-occluded due to neointimal growth and/or shrinkage of the artery. Hyaluronan is present in all blood vessels and, in those arteries that display the layered architecture described above, is enriched in the intima and adventitia, with only a patchy distribution in the media. The amount of hyaluronan depends on the type and age of the blood vessel. For example, human fetal blood vessels such as the umbilical artery contain as much as 40% of their total glycosaminoglycans as hyaluronan, whereas adult arteries such as aorta contain only 4-6% of their total glycosaminoglycans as hyaluronan. The high content of hyaluronan in fetal blood vessels creates a loose and hydrated vascular ECM that provides them with flexibility. This flexibility allows the vessels to be stretched, a property critical for vessels in locations that are under large and variable mechanical forces. The loose, open nature of the ECM created by hyaluronan also allows the vascular cells to move and sort themselves into layers during the formation of arteries and veins. The content of arterial hyaluronan changes as the functional demands of the artery change. For example, hyaluronan plays a significant role in the closure of the ductus arteriosus at birth. The ductus arteriosus is a fetal blood vessel that shunts blood from the right side of the heart of the fetus into the systemic circulation, bypassing the pulmonary circulation to a large extent. At birth, this vessel closes and blood travels from the right side of the heart to the lungs. In preparation for this closure, endothelial cells synthesize and deposit large amounts of hyaluronan into the subendothelial space.1 Hyaluronan creates a swelling pressure in this layer, causing tissue expansion, and facilitates the migration and proliferation of underlying smooth muscle cells. These changes lead to thickening of the vessel wall and its eventual closure. Such changes are not unlike those pathological changes that occur in blood vessels undergoing atherosclerosis or restenosis (see below). Hyaluronan accumulates at different stages in atherosclerosis and restenosis. 2-4 Atherosclerosis is a disease of both muscular and elastic arteries which develops over several decades of life. The disease is localized to the arterial intima and is characterized by the thickening of this layer due to the accumulation of cells, ECM, and trapped plasma molecules such as cholesterol-carrying lipoproteins (Figure 1). The atherosclerotic lesion consists of a raised focal plaque having a core of lipid surrounded by ECM and cells as well as deposits of calcium. With time, the plaque increases in size and can rupture, leading to clotting and the formation of an occlusive thrombus. Although no single hypothesis can account for all the stages that lead to the formation of plaque, a consistent feature of atherosclerosis is the excessive accumulation of ECM components, including hyaluronan. Hyaluronan is present throughout all layers of plaque (Figure 2) and is frequently found where other hyaluronan-binding molecules, such as versican, are present. Fig. 2　An atherosclerotic lesion in a non-human primate that has been stained with a probe for hyaluronan. Hyaluronan is present throughout the lesion. However, from these studies, it is not clear whether hyaluronan accumulation is an early or late event in the development of the lesion and/or whether hyaluronan regulates events that contribute to the formation of the atherosclerotic lesion. To address such questions, researchers have turned to experimental animal models to recapitulate those temporal and spatial events that contribute to the pathogenesis of this disease.3 A number of years ago, it was found that experimental injury to a blood vessel with a balloon catheter in animals fed a high-fat diet caused atherosclerotic lesions to form in a predictable and time-dependent fashion. The lesions developed in the intima of these arteries and were characterized by an increase in the number of smooth muscle cells and macrophages, as well as deposits of ECM. The types of changes that occur in the ECM following injury are quite specific and involve particular molecules. For example, hyaluronan increases in regions of the developing lesions where there is active smooth muscle cell migration and proliferation (Figure 3)3. Fig. 3　Experimental injury in a rat carotid artery. These early changes are accompanied by changes in molecules that associate with hyaluronan, such as versican, the hyaluronan receptor CD 44,4 and TSG-6,5 a low-molecular weight molecule that associates with hyaluronan and that helps stabilize the ECM. Such studies suggest that hyaluronan may influence smooth muscle cell proliferation and migration in the development of atherosclerosis. While injury via a balloon catheter to normal blood vessels in experimental animals is a tool that is used to study the spatial and temporal patterns that give rise to the atherosclerotic lesion, it is ironic that a similar procedure is used by vascular surgeons to treat atherosclerotic lesions in human patients. The procedure is designed to reopen a nearly occluded blood vessel by splitting or dissecting the plaque with a balloon catheter device - a procedure known as percutaneous transluminal coronary angioplasty (Figure 1). Although this procedure results in the successful enlargement of the stenotic lumen, the treated vessels often re-occlude within 6-12 months, creating the need for more angioplasty or surgery. This process of re-occlusion is termed restenosis, and it is believed to be caused by a combination of neointimal growth due to increased smooth muscle cell migration and proliferation, deposits of ECM, and remodeling, a term used to describe shrinkage of the vessel due to recoil and/or vasoconstriction. These processes lead to a decrease in arterial lumen diameter (Figure 1). Despite the fact that these lesions have been recognized for more than a decade, treatment strategies designed to limit restenosis have been largely unsuccessful. These failures no doubt are due, in part, to an incomplete understanding of the biological mechanisms that underlie the formation of these lesions. Close examination of restenotic lesions in humans reveals an enrichment of hyaluronan in those parts of the lesion that have abundant and randomly arranged smooth muscle cells (Figure 4). These hyaluronan-enriched regions also contain hyaluronan binding molecules such as versican but are devoid of other ECM molecules such as collagen.6 However, there are collagen-rich areas next to versican and hyaluronan enriched areas. Although it is not possible to establish the sequence in which these changes occur, it is tempting to speculate, drawing from the experimental animal studies, that regions of restenotic lesions enriched in hyaluronan represent newly forming intima, whereas those areas enriched in collagen may represent old lesion or lesion that has undergone remodeling. This remodeling may involve the replacement of the hyaluronan-rich matrix with a collagen-rich matrix, a transition that occurs during the healing of a wound. Whatever the sequence of events, lesion growth involves a change in tissue volume, which is in part controlled by the nature of the ECM. A portion of a human restenotic artery probed for hyaluronan (red) and smooth muscle cell actin (brown). Note the "lakes" of hyaluronan surrounding smooth muscle cells in this lesion. Tissues rich in hyaluronan entrap water and swell. The rapid expansion of the restenotic lesion could in large part be due to the edematous changes created by hyaluronan and its associated molecules. Loss or breakdown of hyaluronan can lead to expulsion of water, causing tissue shrinkage and reduction in arterial circumference. Thus, this conversion may involve a waterlogged ECM becoming a cicatrix that shrinks and contracts the arterial wall, causing loss of lumen diameter. It is of interest that collagen gels impregnated with hyaluronan show enhanced contraction when populated by smooth muscle cells. * Such results imply that hyaluronan may influence vessel shrinkage during remodeling in restenosis. Whether restenotic lesions are wounds that do not heal or wounds in different phases of healing remains to be determined. Hyaluronan may also serve as a substrate for other cells that form the lesion. For example, monocytes and lymphocytes migrate into the lesion from the plasma as part of an early inflammatory reaction. These cells carry receptors for hyaluronan, and blocking these receptors by exogenous administration of hyaluronan prevents the accumulation of these cells in the developing lesions. 7 Since the presence of these inflammatory cells is thought to contribute significantly to the severity of the atherosclerotic lesion, such studies indicate that hyaluronan or associated molecules may be useful molecules to target to interfere with lesion progression. Hyaluronan is synthesized by the resident cells of the arterial wall: endothelial cells, smooth muscle cells, and adventitial fibroblasts. As in other cell types, hyaluronan synthesis is elevated when arterial smooth muscle cells are stimulated to divide and migrate. These findings plus the observations of lakes of hyaluronan surrounding dividing and migrating smooth muscle cells in injured and restenotic arteries suggest that hyaluronan plays a fundamental role in smooth muscle cell proliferation and migration. In fact, video microscopy of dividing and migrating smooth muscle cells in culture reveals a hyaluronan-rich coat around the cells that expands as they migrate and proliferate 8 (Figure. 5). This pericellular matrix is formed by the interaction of hyaluronan and associated molecules with receptors on the surface of the smooth muscle cells. Two hyaluronan-binding receptors that have been identified on the surface of smooth muscle cells are CD444 and RHAMM (receptor for hyaluronan-mediated motility). 9 Interference with the binding of hyaluronan to these receptors, either by the use of competing hyaluronan oligosaccharides or blocking antibodies to the receptors prevents the formation of the pericellular coats and the proliferation and migration of arterial smooth muscle cells. 8,9. Video microscopic images of dividing (A, B) and migrating (C, D) human smooth muscle cells that have been assessed by the particle exclusion assay. This assay uses fixed red blood cells to outline a hyaluronan-rich coat around the cells. Note, this coat is prominent as these cells divide and migrate. Bar=20 microns for A, B, C, D and E. A portion of a human arterial smooth muscle cell grown on a coverslip fixed in the presence of ruthenium red and prepared for scanning electron microscopy showing individual strands of putative hyaluronan extending from the cell surface with associated ruthenium red positive granules (arrows). Bar=10 microns 8. Cytokines such as PDGF that stimulate the proliferation and migration of smooth muscle cells enhance the formation of the pericellular coats and the subsequent interaction of hyaluronan with versican (Figure 6). These complexes are thought to destabilize cell adhesion and facilitate changes in cell shape. No doubt, it is a balance between the adhesive and non-adhesive forces on the cell that governs the ability of the cell to move and divide. Furthermore, these interactions are critical for cell survival and may determine whether a cell lives or dies! Cells that have been induced to die by apoptosis shed their CD44 receptors. In addition, blocking antibodies to CD44 induce apoptosis in some cell types, suggesting a role for CD44 and hyaluronan in maintaining cell viability. Diagram depicting the formation of the hyaluronan/versican enriched cell coat following treatment with PDGF or with TGF-beta in preparation for cell proliferation and/or migration. Hyaluronan is depicted in red, versican in purple, hyaluronan receptors in yellow, integrins in blue sguares, and collagen as cross-hatching. Endothelial cells also synthesize hyaluronan and, like smooth muscle cells, hyaluronan appears to affect the proliferative and migratory state of this cell type. Degradation products of hyaluronan (i.e., short oligosaccharides) are potent stimulators of endothelial cell proliferation and migration. Furthermore, fragments of hyaluronan promote the formation of new blood vessels in vivo (angiogenesis).10 It is likely that hyaluronan receptors are involved. For example, blocking antibodies to CD 44 block oligosaccharide induction of new vessel growth. Also, hyaluronan fragments induce the synthesis of types I and VIII collagen, which are ECM molecules of the endothelial angiogenic phenotype. Binding of hyaluronan fragments to endothelial cells rapidly initiates the transient expression of several intermediate response genes involved in cell proliferation and migration, suggesting that specific cell signaling patterns are induced by hyaluronan breakdown products. At this point, it is not clear why hyaluronan oligosaccharides stimulate endothelial proliferation and migration while inhibiting these same events in smooth muscle cells. Elucidating the reasons for these differences will significantly add to our understanding of the importance of hyaluronan in vascular cell biology. Hyaluronan is a critical, yet understudied ECM molecular effector of vascular cell phenotype. Its prominence in atherosclerosis and restenosis is clear. However, what remains to be sorted out are the mechanisms by which hyaluronan regulates the biology of the vascular cells and the events that contribute to these diseases. Furthermore, attention must be given to the targeting of hyaluronan and/or associated molecules as strategies to block the development of atherosclerosis and restenosis that claim more lives in the western world than any other diseases. 1. De Reeder EG, Girard N, Poelmann RE, Van Munsteren JC, Patterson DF, Gittenberger-De Groot AC. Hyaluronic acid accumulation and endothelial cell detachment in intimal thickening of the vessel wall. The normal and genetically defective ductus arteriosus. Am. J. Pathol. 132:574-85, 1988. 2. Levesque H, Girard N, Maingonnat C, Delpech A, Chauzy C, Tayot J, Courtois H, Delpech B. Localization and solubilization of hyaluronan and of the hyaluronan-binding protein hyaluronectin in human normal and arteriosclerotic arterial walls. Atherosclerosis 105:51-62, 1994. 3. Riessen R, Wight TN, Pastore C, Henley C, Isner JM. Distribution of hyaluronan during extracellular matrix remodeling in human restenotic arteries and balloon-injured rat carotid arteries. Circulation 93:1141-1147, 1996. 4. Jain M, He Q, Lee WS, Kashiki S, Foster LC, Tsai JC, Lee ME, Haber E. Role of CD44 in the reaction of vascular smooth muscle cells to arterial wall injury. J. Clin. Invest. 97:596-603, 1996. 5. Ye L, Mora R, Akhayani N, Haudenschild CC, Liau G. Growth factor and cytokine-regulated hyaluronan-binding protein TSG-6 is localized to the injury-induced rat neointima and confers enhanced growth in vascular smooth muscle cells. Circ. Res. 81:289-96, 1997. 6. Wight TN, Lara S, Riessen R, Le Baron R, Isner J. Selective deposits of versican in the extracellular matrix of restenotic lesions from human peripheral arteries. Am. J. Pathol. 151:963-73, 1997. 7. Ferns GA, Konneh M, Rutherford C, Wollaghan E, Anggard EE. Hyaluronan (HYAL-BV 5200) inhibits neo-intimal macrophage influx after balloon-catheter induced injury in the cholesterol-fed rabbit. Atherosclerosis 114:157-64, 1995. 8. Evanko SP, Angello JC ,Wight TN. Formation of hyaluronan and versican rich pericellular matrix is required for proliferation and migration of vascular smooth muscle cells. Arterioscler. Thromb. Vasc. Biol. In press, 1999. 9. Savani RC, Wang C, Yang B, Zhang S, Kinsella MG, Wight TN, Stern R, Nance DM, Turley EA. Migration of bovine aortic smooth muscle cells after wounding injury. The role of hyaluronan and RHAMM. J. Clin. Invest. 95:1158-68, 1995. 10. Rooney P, Kumar S, Ponting J, Wang M. The role of hyaluronan in tumor neovascularization [review]. Int. J. Cancer 60:632-6, 1995.